« At What Price, Truth? Once when I was about 20 years old, in-between College Enrollment #1 and Huge Life Mistake #2, I was crashing at my mom’s for a while as our family tried to spiral back into normalcy after my father’s untimely death. Long an avid reader, my mom always had a handful of paperbacks lying around, waiting to be read or put on a shelf or donated. One night, MTV-fueled insomnia in full force, I picked up one of mom’s novels with the intention of reading myself to sleep. However, the book turned out to be more engaging than I thought, and I kept turning pages. By 5 a.m., I realized I might as well just finish the stupid thing and be done with it. To this day, I couldn’t possibly tell you the title of that book. It was okay—good enough to get me to read it all in one sitting—but… it didn’t stick with me. Not then, not now. It just wasn’t a great book. For me, a book is great when it’s one you can’t shake, whose plots haunt you in your sleep, and whose characters visit you when you least expect them to. This would be a fitting description of April L. Ford’s The Poor Children. First, the writing. In The Poor Children, Ford demonstrates the rarest of writerly gifts: she doesn’t get in her own way—in fact, quite the opposite. Ford utterly disappears into her work, perhaps most notably in “runawaybitch13,” where the protagonist’s voice is so skillfully and convincingly rendered that we almost don’t notice how transparently the character attempts to convince herself and her audience that she is far brighter than everyone thinks. As a writer and an editor, I am one of those irritating Grammar-Nazi types. I believe things should be perfect when they get to the published page. As such, I initially grew a little annoyed as I made my way through “runawaybitch13” the first time. I wanted to send Ms. Ford a message, like a bit of workshop advice: “It’s D-O-W-N Syndrome, not ‘Downs’ with an ‘s,’ and no kind of pill taken by the mother during pregnancy will cause it!” Reading further, I realized the truth of the matter. It wasn’t Ford’s writing I was taking issue with, it was her character. Ford got me. I was so preoccupied with scrutinizing the writing that I almost forgot the characters weren’t real, that the story was fiction. The authenticity of the character’s voice in “runawaybitch13” was so spot on, I readily subsumed the story’s reality into my own. I got caught up. And I was astonished at the skill with which I was drawn into their reality. Ford has an uncanny ability to inhabit the psyche of her characters, navigating their idiosyncrasies as though she’s lived them herself and been comfortable with them for decades. An early example of this is in the book’s first story, “Layla,” the story of a young woman working as a corrections officer in a juvenile treatment facility and struggling with the realization that she will soon be a mother herself. The self-doubt and apprehension of a first pregnancy, juxtaposed against the details of juvenile crime to which she is exposed every day, haunts the mother in ways few of us could conceive of or understand. She vacillates, rightly, tellingly, between an initial rejection of the concept of motherhood (“I never want children. I hate them all.”), to a halting acceptance of the idea (“I’ll keep it if it’s a girl. If it’s a girl, I’ll name it Layla.”), to confronting fears common to most all mothers–what if the kid’s a monster? What if the father leaves? Ford’s deft, confident handling of internal monologue and point of view generates a pervading sense of sympathy and dread and humanity that I, speaking as a parent, find both credible and accurate. What makes the story shine, however, is the kernel of hope that we readers can cling to after the final paragraph has been read. It’s a hope that is neither expressly stated nor ham-handedly implied. Instead, it rests in the thoughts and actions of the protagonist, allowing us a satisfying measure of anticipation amid the gloom. Where a lesser writer might run with familiar tropes and predictable stereotypes inherent in a story based on child sexual abuse in a mobile home park, Ford feints that way before tearing off in the other direction. “A Marmalade Cat For Jenny,” written in the first person from the perspective of Jenny’s older brother, Scott, is simply masterful. Its narrative arc – with not a misstep from the first word to the last – is precise, haunting, and agonizingly revealed. Ford’s pacing is particularly impressive in this, the second-longest (by page number) of the seven stories in the book, and the longest chronological arc of the book. The story focuses on Jenny, a beautiful and precocious nine-year old who suffers the fate of being loved by all; most inappropriately by her own father. While the catalyst for the story’s conflict may seem tired, the abuse is merely a vehicle for the deeper tragedy, the often overlooked tragedy of life after the abuse. Ford shines in her construction of the triangular relationship between Jenny, her older brother Scott, and Mark, a foster brother to them both and who competes, after a time, for Jenny’s affections. Spanning at least five years, “A Marmalade Cat For Jenny” never feels too rushed or too slow, and the well-paced unraveling of Jenny’s future is as heartbreaking as it is harrowing. By story’s end, the final half-page delivers an emotional gut-punch on par with any such story I’ve ever encountered. It is the crowning achievement of the book. I can’t recommend highly enough your interest in this book. Though there are indeed a handful of missteps sprinkled here and there, the fact is they are minor (word choice issues, for example, the faux newspaper story at the end of “runawaybitch13” reads more as fiction and less as journalism, there are minor plot holes here or there) and hardly worthy enough to outweigh the overarching triumph that is Ms. Ford’s grimly satisfying first book. 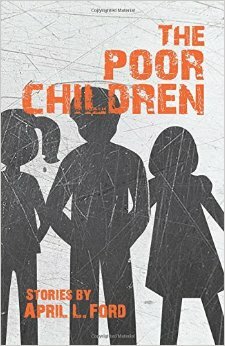 The Poor Children is available tomorrow from Amazon, the publisher’s site, Santa Fe Writer’s Project, and from April L. Ford’s website. With “beach book” season just around the corner, the weight, the import, the challenge of The Poor Children makes it the perfect book to slam shut the door on another year of cabin fever and get yourself ready for all those easy, throwaway stories you’ll breeze through this summer and never remember. I promise you, The Poor Children is a book you won’t so easily forget. This entry was posted on March 31, 2015, 7:00 am and is filed under Guest Bloggers. You can follow any responses to this entry through RSS 2.0. You can leave a response, or trackback from your own site. Ron, that’s a great and thorough review of the book. Thank you Eric! It was my pleasure to do it.